why women earn less than men and what we can do about it. Are you struggling to cover your household expenses? Do you wish your income allowed you a few luxuries? 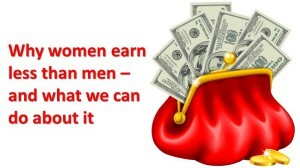 If you are a woman, you are more likely to be trying to stretch your pay further than your male counterpart. Official statistics prove what we already know: women earn less than men doing the same job. In 2010 the US Census Bureau found a 19% difference between genders for full-time work, and that gap is still there. In Europe the situation is not much better as the European Commission reported a 16.2% gender income gap in 2013. We live in the western world in the 21st century; why do we still accept this situation? It’s true that historically women were paid less than men for the same work; it’s also true that we women spend years of our lives working very hard in unpaid roles. We learn these roles from our home and our society. Looking back: My mother did not start paid work until I was 15 years old. Both my grandmothers supported their husbands in their successful businesses – one working as a shop manager supervising several staff members, and the other working as a pub manager, also with managerial duties. Neither was paid a wage. But these lessons are not only learned at home; society reinforces them. In the UK, a recent study by The Warwick Institute found income disparity starts as soon as graduates leave university. Depending on the degree, the gender income gap varies. Taking law as an example, a female law graduate can expect to earn a starting salary of £20,000 (€23k), while a male with a law degree will on average take home £28,000 (€32k) per year in his first job. There are many reasons for this sad state of affairs. As women, we naturally adopt the caretaker role from our mothers. Once we have a family of our own, we have a tendency to follow a similar pattern. But why should a man earn more than a woman? What makes companies offer women lower salaries than men? That statistics deserve a closer look. Often women themselves choose a career path that is more or less guaranteed to pay less. Going back to a career in law, the highest paid professionals are the trial lawyers, a role favoured by men, whereas some women may prefer a more secure and stable position. To give an example: In the Netherlands, currently the majority of judges in Dutch courts are women. This phenomenon has been explained by Sociologist Bregje Dijksterhuis. In the Netherlands, a judge is appointed for life, which brings security and is also considered a role that can be balanced with family responsibilities. The Netherlands is now considering positive discrimination to appoint more men to the judiciary. Furthermore, women have a tendency to stay in their comfort zone. Think of the number of businesswomen you know providing products or services to a predominantly female target market. Marketing to women works well in a market where women are considered the decision makers; but a female market that, historically, has less disposable income needs to develop a new mindset when considering luxury or new lifestyle products. Such a change of mindset is exactly what women need in order to grow out of this situation. We need to understand that putting ourselves and our careers first is also a way of supporting and nurturing our families. Many of my clients battle with the decision to go back to work after having a baby; then, having made the decision, they struggle to balance the two roles. We also need to look at our career choices and fight for the roles that will be most fulfilling for us, both intellectually and financially. Coming back to the law as a profession, one young lady I spoke with recently was applying for pupillage in order to be able to take the bar exams. She was not granted pupillage; instead, one barrister offered her a position as his personal assistant. Thankfully she stayed focused on her goal and turned down the offer. In brief, we need to be brave enough to move out of our comfort zone and dare to promote ourselves and our products and services to a market that is prepared to pay a realistic price for them. By all means sell to women, but know – and believe – that women are aspiring to greater things. We have a new game plan, and we will achieve our goals. This article was first published on the website International Women in Business, and the October 2015 issue of colorszine.